Today we’re in for a little color changing chemical reaction fun. 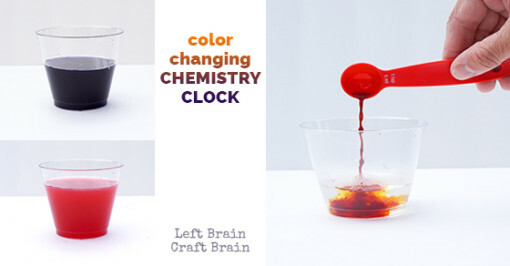 In this Color Changing Chemistry Clock, yellow solutions become clear. Clear solutions become dark blue. And dark blue solutions become any color you want. Literally enough chemistry magic to excite even the most bored of kiddos. 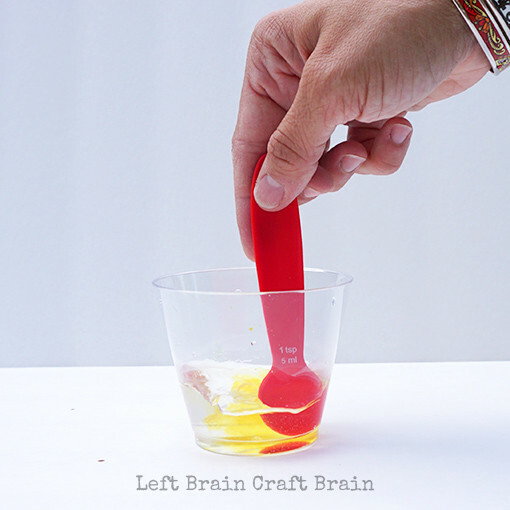 These experiments totally blew my preschool-aged daughter’s mind! 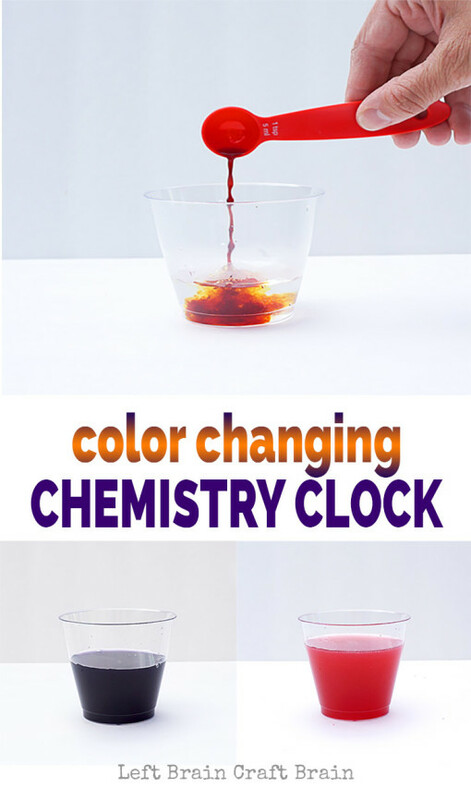 There are four experiments for you today, all based upon the science of the Iodine Clock Reaction. I’ll go into a little bit of the science after each experiment, but the gist of it is that iodine is reacting with starch in the presence of Vitamin C. The Vitamin C slows the experiment creating what the call a clock, because the timing depends upon the amount of chemicals reacting. 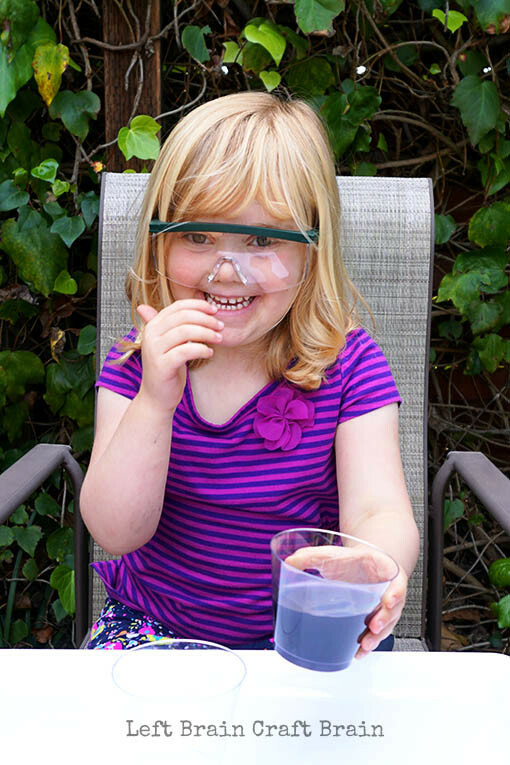 Although the science explanations may be a little advanced for preschoolers, the magic of the experiments definitely isn’t! Safety Note: Always wear safety glasses when experimenting with liquids as they can easily splash. Iodine stains, so be sure to cover surfaces and clothing as well. Solution #1: Crush 1000 mg of Vitamin C inside a zipper baggie. You can stomp on it with your feet or take a mallet or rolling pin to it. My daughter loved all three methods :) Mix the crushed Vitamin C with 2 oz. warm water in one of the clear plastic cups until dissolved (or at least mostly!). Solution #2: Pour 2 oz. warm water into a second clear plastic cup. Add 1 teaspoon of Solution #1. Mix thoroughly. Solution #3: Pour 2 oz. 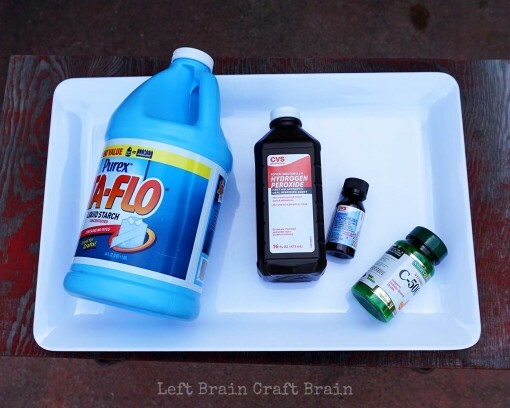 warm water, 1 tablespoon hydrogen peroxide and 1 /2 tsp liquid starch in a clear plastic cup. Mix thoroughly (the solution will be somewhat cloudy because of the starch). Add 1 teaspoon iodine tincture to Solution #2. The brown color of the iodine will disappear as the liquids are mixed. Save this Solution #2 for the next experiment. What happened? The Vitamin C reacted with the iodine to create two different iodide molecules. Iodide is colorless, so the yellow of the iodine disappears. Combine Solution #2 & Solution #3 in a clear plastic cup. Stir until the clear solution turns dark blue. What happened? Iodine is reacting with starch to create the dark blue color. The same thing happens when you put iodine on a cut potato. The reaction takes a little while to happen because all of the Vitamin C must be used up, so that it can’t convert the iodine to iodide. Once that happens, boom, it turns blue. Crush another 1000 mg of Vitamin C and sprinkle over the remaining mixture from Experiment B. The solution turns back to clear. What happened? This is what’s called a reversible reaction. When there is extra Vitamin C in the cup, the iodine that had combined with the starch to make the purple color instead reacts to create iodide. Repeat Color Changing Experiment B so that you have another cup of dark blue liquid. Divide it equally among three cups. 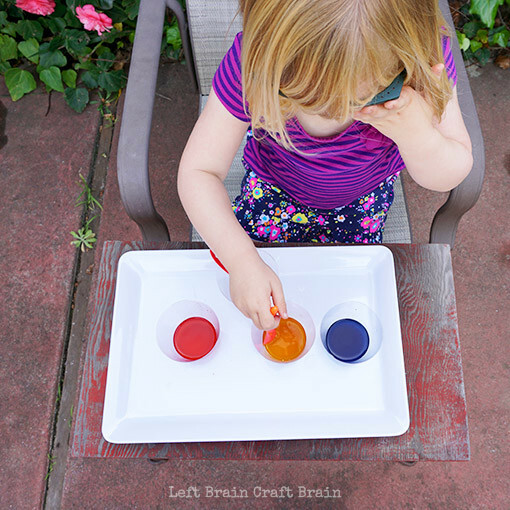 Now here’s the mystery… While your kiddo isn’t looking, add 3 drops of food coloring in each cup (we used red, yellow & blue but any color is fine). Now have the kiddos guess what color is in each cup. To reveal the mystery, add 1 teaspoon of Solution #1 to each cup and stir. What happened? Same science as before, but the dark blue of the iodine – starch reaction hid the food coloring, creating the mystery. What was the biggest surprise in this experiment? What do you think scientists do? What would you do if you are a scientist when you grow up? 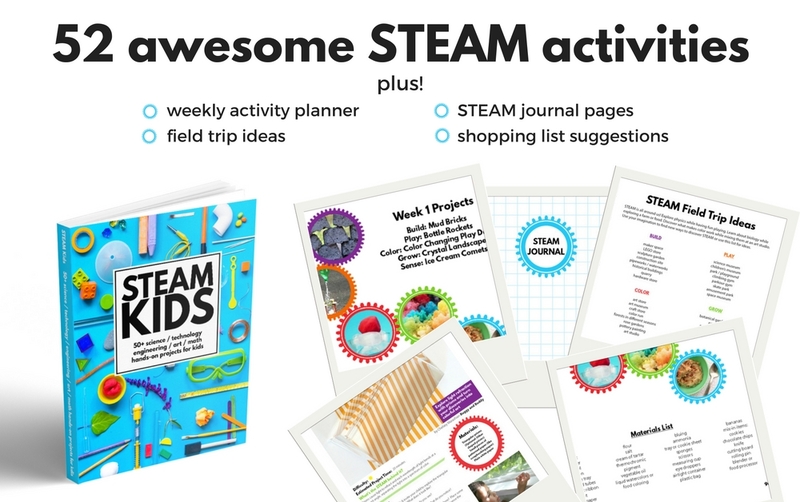 This post is week 2 in a 5 week series with some of my favorite bloggers who all love STEAM. Because learning with Science, Technology, Engineering, Art & Math gives kids the power to do almost anything they can dream up. Like change colors… Or glow… Or make things move. This week is all about ways to make things React. Inertia Zoom Ball // What Do We Do All Day? Did you see last week’s post where we all learned to Fly? 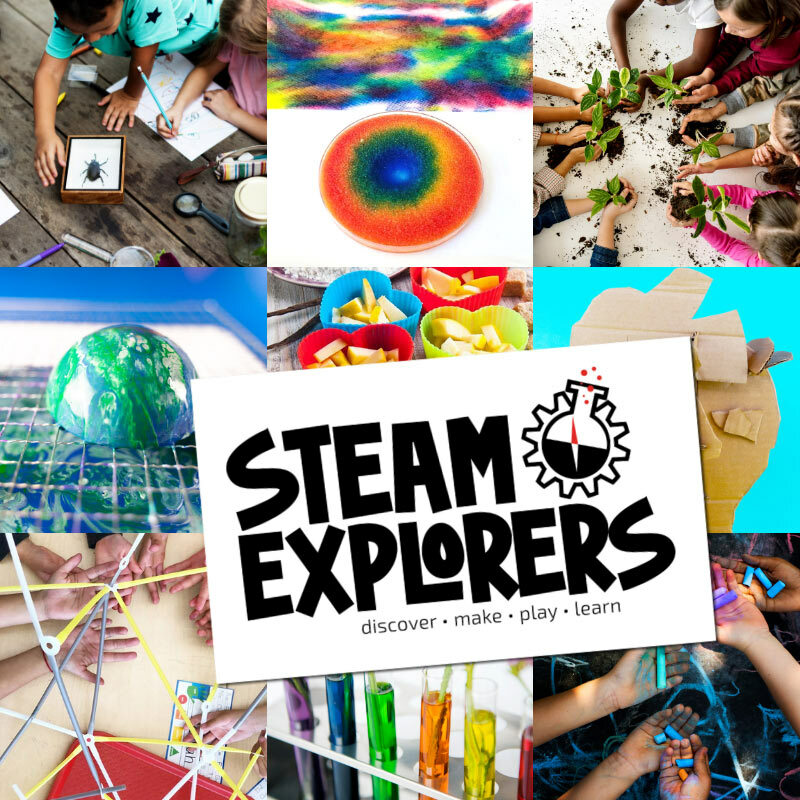 And be sure to follow along for the next three weeks while we Harness, Compute and Grow, all with the power of STEAM. I love all of these! I must get some of these ingredients and give them a try! How fun. Love that smiling little cutie pic!